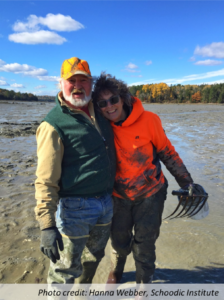 and collaboration is the “ride-along” (or “clam-along”) where representatives from different interests get a chance to accompany one another on work outings. 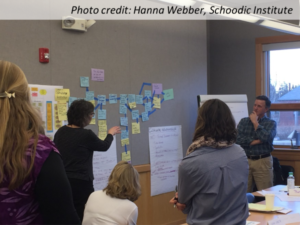 Reactions to the workshop and process were overwhelmingly positive – as an example, one stakeholder expressed, the process was “really, really valuable. I feel very grateful to have been here! I liked the…collaborative emergent organization.” While relationships between harvesters and law enforcers in the region have been tense in recent months, this workshop and the alliances formed through it are a bright spot showing the strength of open dialogue and a common language and solid tools for framing discussions and making decisions. FOS team member, Arlyne Johnson, and colleagues published a powerful article illuminating the importance of going “full cycle” in the Open Standards process. Published in Biological Conservation in 2016, the paper To protect or neglect? 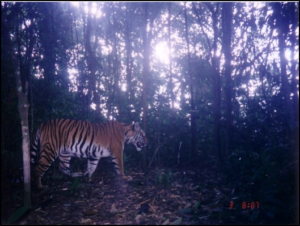 Design, monitoring, and evaluation of a law enforcement strategy to recover small populations of wild tigers and their prey illustrates how a results chain and associated theory of change was used to evaluate the effectiveness of a recent law enforcement strategy to recover tigers and their prey in Lao PDR.